At the height of his fame, Archie Williams achieved greater public renown than pretty much any other meteorologist in history. He played a part in a revolution with a lasting impact on society seventy years later. He was a pioneer in another revolution that has yet to realize its potential. Surprisingly, few meteorologists have heard his inspiring and unlikely story. Now is the time to tell it, especially because this is Black History Month. Archie Williams was one of the first African American meteorologists. His story must be known—a reminder of the perseverance and talent of pioneers as well as the cost of having so few African Americans in our science community. What follows is admittedly unusually long for a post in this blog. But the story is unusually compelling too: many readers will be interested going a step further and reading Williams’s full story in his own words. We encourage you to seek the oral histories from the Bancroft Library of the University of California, Berkeley, and the Amateur Athletic Foundation of Los Angeles. Everybody was broke. You ate a lot of beans and stuff like that. I never missed a meal and I never went to school with holes in my shoes. Racial discrimination reared its ugliness, as well—a swimming hole at a nearby amusement park didn’t allow blacks, for example, nor did some local restaurants and theaters. Boy Scouts were off limits as well, even though many of Williams’s white friends were in the local troops. These conditions rankled him but were small irritants compared to the limits he would encounter later. Williams had typical pursuits, camping and fishing, building a wooden boat based on plans in Popular Science magazine, playing sandlot baseball. Plus he had won a local contest for his model airplane making—airplanes were a passion. And he liked to run races, eventually joining the track team in high school. Despite success in athletics—the quarter mile was his distance—Williams says he “fooled around a lot” in school, with poor grades to show for his attitude. After high school, he got a job as a golf caddy, but a friend suggested they try going to a junior college. The two young men decided studying might be cheap enough and better than menial work. This is where the Archie Williams story takes a turn toward the remarkable. Here was a typical kid, not serious about anything, not marked for greatness. Williams was the kind of indifferent student probably none of us would have expected to wind up in science. How many students give up because they drift through high school? Because they are the sons of grocers and cooks? Because they don’t look like the people who are in various professions? Williams, however, made the most of his second chance at school. He decided he wanted to improve his lot and be an engineer. He also found a talent for school. He took trigonometry for the first time. Analytical geometry. Physics. Surveying. Subjects came easily. He got A’s. Within a year, Williams had taken enough courses to qualify for the University of California at Berkeley. It was 1935. Berkeley’s track coach, Brutus Hamilton, was of the same mindset—he was an anachronism even then. He was a “father figure” who knew his athlete’s grades, not just their lap splits, by heart. Hamilton was an exception in another way: There were maybe a few dozen black students at Berkeley at the time, and Hamilton must have known he’d lucked into a special one when Williams asked to be on the track and field team. At a time when many college coaches wouldn’t allow black athletes, Hamilton was open to anyone. While Williams was succeeding in the engineering labs, he was progressing just as rapidly in the stadiums. Sports were an equal channel for his determination and skill. By the spring of 1936 the unknown quarter-miler had dropped three seconds off his best time. He was doing well enough to win the NCAA championships in Chicago. Williams was breaking records. That summer he qualified as one of nine African Americans to represent the United States in the Olympic Games—in Hitler’s Berlin. I think they wanted to see if the black would come off if they rubbed our skin. Jesse Owens might have been snubbed by Hitler, but he was a hero in the eyes of the Germans. They followed him around the streets like he was the Pied Piper. Hitler had suspended many of his regime’s most odious rules during the games. The team, by contrast, offered only segregated room assignments for the African Americans and other non-white athletes. 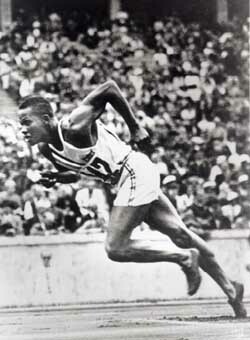 Teammate Jesse Owens outran all the lions: he won four golds. In all, the African American track stars won 13 medals. They toured Europe as goodwill ambassadors and returned home heroes. Ultimately Jackie Robinson, younger brother of one of Williams’s fellow Olympians, broke the color barrier in baseball and triggered a flood of African Americans into the sports limelight. But Archie Williams, Jesse Owens, and the Olympians of 1936 not only had embarrassed racial supremacists in Germany but also sent that initial–and very clear message–to fellow Americans. The revolution of opportunities in athletics began with these young men. Sports would become a popular, powerful path to success for determined African Americans. There they were eventually welcomed to show their talents and compete unfettered. Thanks to the zealous Nazi propaganda to the contrary, Williams and his fellow African Americans had exercised an unprecedented power in politics and public opinion. They had achieved at an international scale. But at home discrimination still kept them out of certain track meets, professional sports, and a host of careers at home. One of those forbidden careers in the late 1930s, as Williams discovered when back at Berkeley, was engineering. By this time his track career was suddenly over, due to hamstring injuries. What might be a crisis for a young, star athlete of today was not for the focused and capable Williams—he was at school to be an engineer. But the campus engineering societies were not open to African-American students. When I went and signed up for engineering, my counselor said, “You’re crazy. Why don’t you be a preacher or a real estate man or something like that? You’re not going to get any job as a engineer.” I said, “Well, I want to study it, so just sign me up.” Then at the end they arranged interviews with General Motors, Lockheed, and other firms. And he did it, well, almost on purpose, just to show: “See what I told you.” They said, “Well, you have a nice record. Don’t call us, we’ll call you.” I knew it wasn’t going to be, but I did it anyway. No one would hire Williams to be an engineer, but ironically the Nazis intervened in his life again. Their relentless aggression would open yet another channel of achievement for African Americans–in science and aviation. Williams had participated in the campus ROTC training even though—ironically—he was not eligible for an officer’s commission even though he wanted to serve in active duty. Furthermore, in 1939, the year he graduated with his engineering degree, Williams was working at Oakland Airport doing maintenance in exchange for opportunities to take flying instruction through the Civilian Pilot Training Program. Eventually he was rated as an instructor—and took students unofficially because African-Americans weren’t allowed to teach flying. His background would prove perfect for the occasion. Retaining these trained meteorologists in the field was a major thrust of the expansion of the AMS after the war. Some of the Tuskegee weather officers pioneered in meteorology after the war: the first African American weather cadet, Wallace Reed, became the first African American meteorologist in the Weather Bureau. John Willis went into weather technology development at Air Force Cambridge Research Laboratory. And Charles Anderson went on to be the first African American to earn a Ph.D. in the field and taught for many years as a professor at the University of Wisconsin and North Carolina State University. At age 27 Williams was considered too old to be a fighter pilot and qualify as an officer that way; so he was ranked a cadet in the weather school. 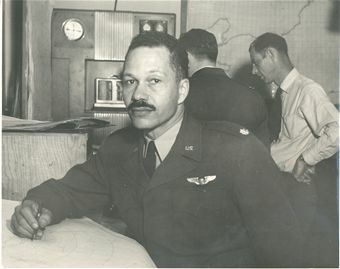 After the course at UCLA, however, he was finally sent back to Tuskegee to serve as a lieutenant—a weather officer—forecasting and mapping the weather, and eventually again teaching introductory flying skills. We would get up in the morning. Since you had training and weather, you would jump in that plane and check the weather. I used to go up and fly around and see how the weather was, call back and say, “It’s okay to fly.” [laughter] A couple of times we got up there and had to fly away to Birmingham; the weather was so bad we had to spend the night in Birmingham. But it was fun. It was great because I was doing what I liked to do. Williams and his Tuskegee colleagues were paid considerably less than their white counterparts at other bases. Nonetheless, after the war, Williams was a rare qualified pilot with meteorology credentials and stayed with the air force (as did several others of the 14 total African Americans who graduated in the military weather officer training program). With Truman’s order to desegregate the air force came new opportunities. By 1950 Williams had added a degree in aeronautical engineering from the Air Force Institute of Technology. He flew missions over Korea as well as forecasted for the war from Japan. He made a career as meteorologist for a number of air bases, in New York, Alaska, and California, finally retiring as a lieutenant colonel in 1965. While athletics was progressively more and more attractive to motivated young African Americans, science and engineering, indeed weather forecasting, were slow to attract even highly trained people like Williams. Remaining true to his passion for education, Williams decided he might enjoy teaching as a post-military career. So he took teaching courses at the University of California-Riverside while finishing with the air force and then moved on to teach math and computer science for an affluent, largely white high school near San Francisco. From this position he also did some coaching and reached out with programs for underserved students in nearby schools. A man who pulled himself up with a rare college degree, who was determined to study sciences, who helped open the floodgates for thousands of talented African American athletes in succeeding generations, who defied Nazi propaganda with Olympic gold, and who defied regulations so he could teach others to fly—such a man left dreams of engineering and experience in meteorology behind despite 22 years in the field. Nonetheless, he had achieved lasting fame. And Archie Williams had changed the world…of sports, in particular. He opened doors for African American athletes. We all know that revolution turned out spectacularly. Only two percent of AMS members are African Americans. In the race that Archie Williams wanted to win most of all—education and science—we have not yet reached the finish line.